Microsoft Exchange Server stores all mailbox items like emails, contacts, calendars, notes, journals, etc. in EDB file format. The Exchange EDB File may contain a huge amount of data according to the usage of the mailbox. 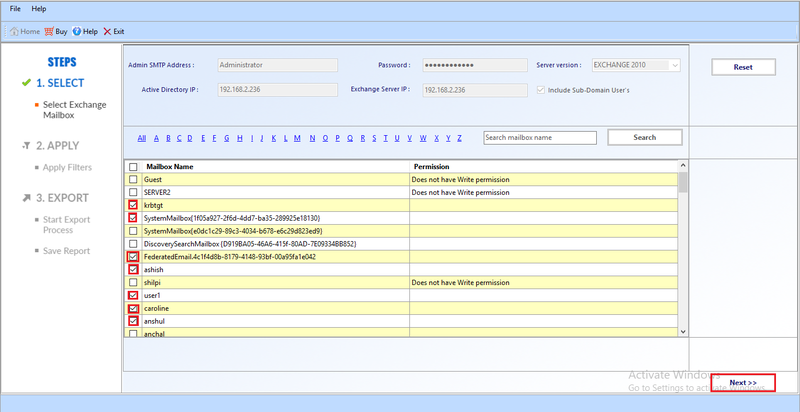 Within Exchange environment, Administrator can export all Exchange 2010 mailboxes to PST File of Specific Date Range. While Exporting large size database into PST File format, Administrator can use the Powershell Command “New-MailboxExportRequest ContentFilter DateFormat” to save only the certain period data. In this section, we will discuss how exporting of all Exchange mailboxes to PST file within the specific Date range is accomplished. We shall start with the manual solution moving towards the end discovering a professional tool easing the effort done. How to Export Exchange 2010 / 2007 Mailboxes into PST via PowerShell? 2. Select specified Date Range to export selected Mailbox items into PST format. ii. Then, run the below command to export Exchange mailboxes with their names. Run the below command to export Single Exchange mailbox to PST format. If the Administrator finds, using the PowerShell command to be tiresome and wishes to use the EAC, then, we like to inform that in EAC (Exchange Admin Center), the Administrator cannot filter the mailbox items within the particular Date range and always all the data from Exchange mailboxes will be migrated to PST format. Also, if the Exchange Administrator wants to use a GUI application to execute the exporting process, then, we provide you with a professional GUI solution offered by SysTools. A GUI Application that offers Date-Range Filter while helps to export all Exchange 2010 mailboxes to PST file within specific Date range. The SysTools Exchange Export Tool facilitates to export all Exchange mailboxes from EDB file to PST format of a particular date range at ease terms. 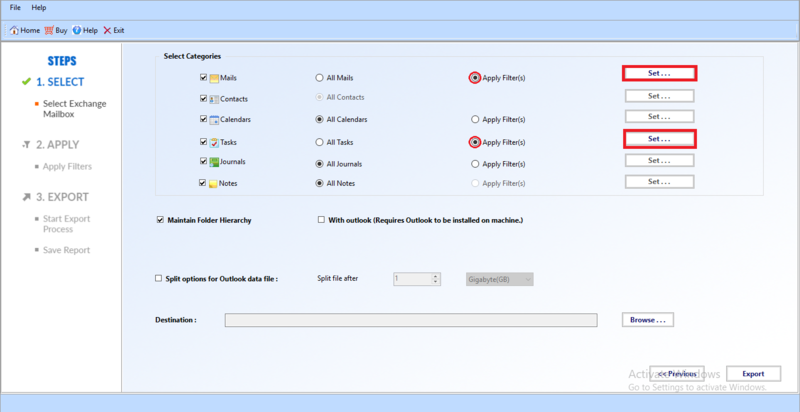 It offers a Date based Filter Option to select the mailbox items within the specified date range. Let’s have a look how does this Exchange Export Tool work. To start migrating the Exchange mailboxes, you need to install and run the Software. Provide valid credentials such as Version of Server, Active directory IP, and Exchange Server IP to access the mailboxes details. Now Software Displays all list of mailboxes along with its Read / Write Permission. According to permission. Then, select the desired mailboxes to export data into PST File format of a certain time period. Now Apply Filter(s) to the mailbox item and Set the time period of the data items that are to be exported to the PST file format. 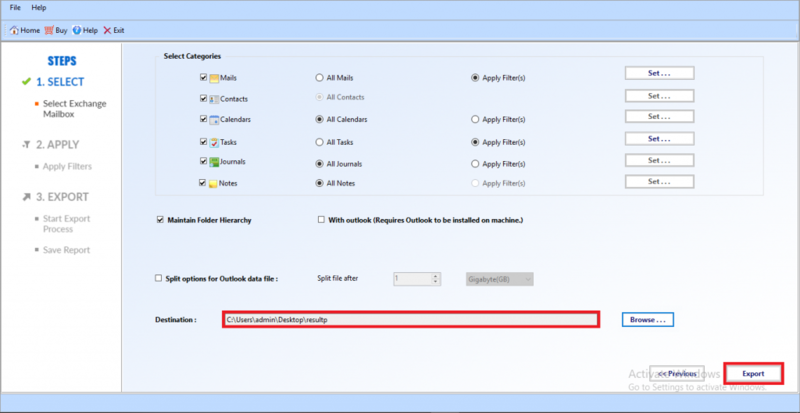 Use Mail Date Filters to set the date interval to export mailbox to PST of exchange 2010 within specific Date Range. Note: The Date Filters are used to set the Date Range for different mailbox items such as Mails, Calendars, Tasks, and Journals to export only the data of that certain time period. Provide the location to save the PST file and Export the mailboxes items to PST file. Finally, view the PST file from the desired location. In this blog, we have discussed the process to export all Exchange 2010 mailboxes to PST file within the specified date range by using PowerShell Command. If the manual method does not work, then you can go for the Exchange Export tool. However, we have mentioned a Trouble-Free solution to export specific Exchange mailbox data to PST format.